My daughter is 8 and we have built up quite the large collection of adorable hair clips, barrettes and more. Most bows I have had custom made to match certain outfits. Little girls can never have too many bows I tell ya! My daughter would agree whole heartedly. The only problem we run into is finding a good way to store our precious bows. The bigger bows (such as the big pink one on top) tend to get crumpled and smashed when they are sitting in her hair accessory drawer. I probably paid a good $6 each for and every time one gets ruined that's money down the drain. Having a nice barrette holder is key to organization and keeping our precious bows safe. Liane Fried has designed some absolutely adorable barrette holders. 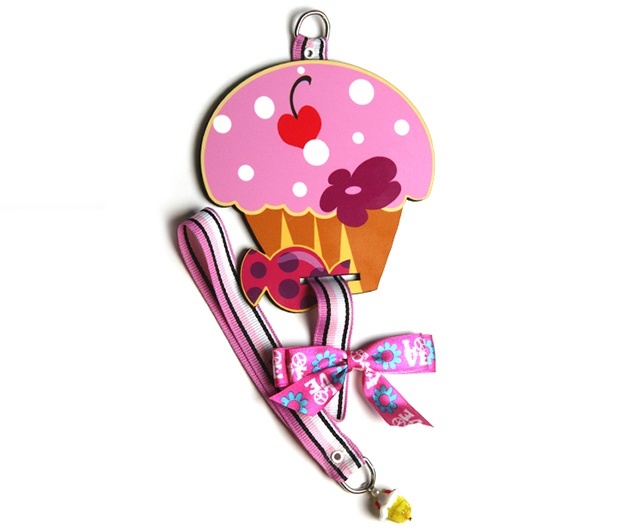 The cupcake barrette holder we received is high quality and the colors are delightfully vibrant. Also available are the cat, ladybug, flowers and puppy dog called woof-woof. Each holder is about 18" from top to bottom and the ribbon to hold the accessories is about 12" long which can hold between 8-10 barrettes. Our cupcake arrived packaged in a clear cellophane bag and when we opened it we discovered Liane had signed the back! I checked her website and every holder comes with her signature. I think that is so special and shows how much she values her artwork. Can you imagine with me how beautiful a few of these holders would be together? Maybe on the front of a closet door, staggered and full of hair bows. I think that would be gorgeous! Liane also has designed other items with a similar cupcake design. You can find a wall clock, bookmark and desktop clock. You could do a whole cupcake theme. We just love our cupcake themed barrette holder from Liane Fried Studios and hope you will check her website out, follow on Facebook and find her on Pinterest. Want to WIN this whimsical cupcake barrette holder from Liane Fried Studio? Enter Below! Must be 18+, US only.